Ertholmene or ”Christiansø” Christians Island as it is generally called. How to get to Ertholmene. Christian’s island is located about 20 km NE of Gudhjem in the Baltic Sea and is Denmark’s easternmost point. 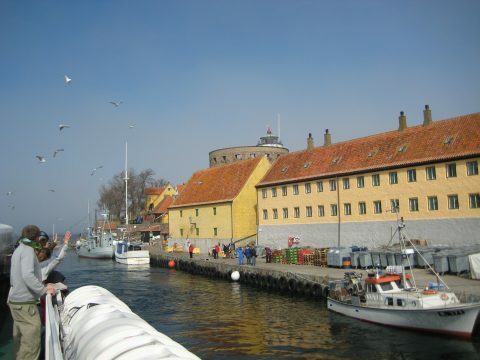 From Gudhjem you can catch the mail boat “Peter” to Christian’s island, a little Danish island off Bornholm. During the summer there are also “Ertholm” from Gudhjem and the” Expressen” from Allinge they have several departures daily. The ferry Ertholm on the way to Christiansø. Christian’s island, Frederick’s island and Graesholm Island together with a number of minor rocks make up The Ertholmene. The Ertholmene belong to the Danish Ministry of Defence. To keep an eye on the movement of the Swedish navy in 1684 the Danish navy built a naval fortress on the islands and during the construction up to 450 people were working on the islands. The total size of the islands is about 0.36 Square Km or 36 hectares. Graesholm is a bird reserve, Christiansø and Fredericksø are connected with a pedestrian bridge and today there are about 100 people living on the islands, in 46 houses, and there are about 40 holiday houses on the islands. The Danish Ministry of Defence has employed an administrator to the islands to run the day to day duties on The Ertholmene, such as, the economy, chief of staff, police, celebrant and more. They have a nature and scenery which will be hard to find anywhere else and everything on the islands is preserved and there are no cars on the islands. There is a museum on the island where you can see a model of the Navy base as it looked in 1855 and there are some army, nature and cultural exhibitions and an exhibition about fishing during the olden days, at the museum as well. The oldest building, “Store Taarn”, The Big Tower was build in 1684 and is the main building at the fortress, the light house was built inside the Big Tower in 1805. There is a little grocer’s shop on the island, during the summer months a kiosk opens as well where you can get souvenirs, postcards, sausages, ice-cream and lollies. The only production on the island is, “Ruth’s sild” Ruth’s herring, a herring made with an old local recipe, only a limited production is made due to the business size. Christians island's Inn and kiosk. The school on Christians island. There is one school on the island with 3 class rooms, two small ones and one larger class room. The two small classrooms are used by years 6 and 7 and the larger classroom for the younger students, years 1 to 5. After year 7 the kids go to boarding school on the mainland or high school on Bornholm, at the time this was written the school had 11 students. Today however most families with kids leave the island when the oldest child is at the end at year 7, in order for the family to stay together instead of sending the child to boarding school on Bornholm or in Copenhagen. The school on Christians Island only had 2 teachers (a principal and a teacher) unless they were lucky and got a principal that was married to a teacher or someone with experience in teaching who could help out at the school. At a school with that few students you can be certain that your homework will be checked every day. There is also a very good connection between all the students, teachers and parents and everyone knows each other and at a kids birthday party all the kids at the school are invited. The school at The Ertholmene. Old traditions on the island. With a population of only 100 people everyone knows everyone and there is often an event happening at the Moon (community center). Anyone organising a Ball or a party is in charge of the beers, arrangements and the cleaning up and they go for a walk around on the island equipped with an air horn to notify the residents: Big Ball at the Moon tonight at 8.30, everyone is welcome. The traditional and bigger parties or balls are at New-year, spring carnival, summer ball and Christmas. 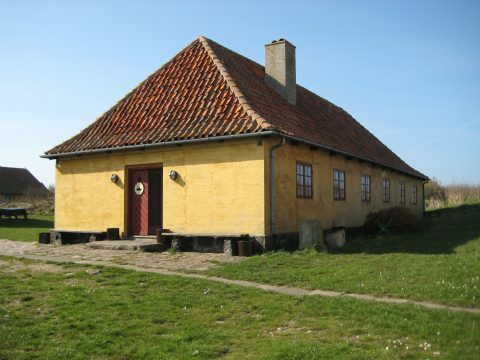 On Frederik’s island you will find a red house, this is the only red house on Christians and Frederik islands, all other houses are yellow. The story is that the executioner used to live here but after a fight with his helper over a lost pair of slippers he killed his helper. Because there was no one to execute him on the island he was transferred to Bornholm where he could be beheaded and after that the island hasn’t had an executioner. 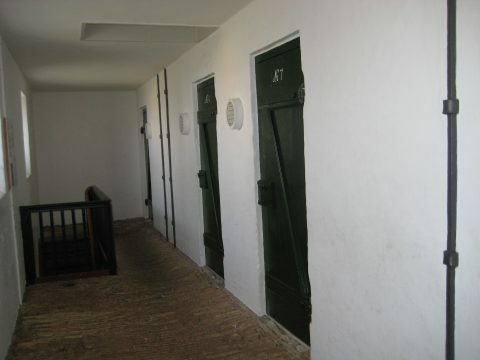 The old jail on the island, now used as hotel rooms. 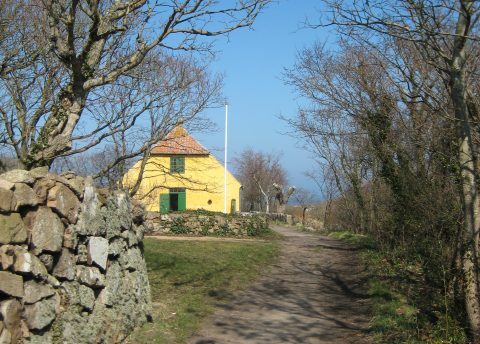 A visit to the island is highly recommended, about 80 000 tourists take the trip to Christian’s island every year, most of them on a day trip from Bornholm. The islands are a popular destination for yachtsmen as well, there is a campsite on the island, but it is a good idea to book in advance, there is only room for 20 tents on the site, or you can book one of the 6 rooms at the Inn on the island. It is possible to get a guided tour on the islands by one of the 3 local guides on the island. 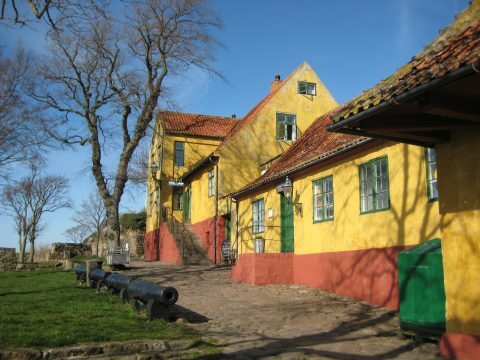 Leave Ertholmene And Go To Denmark-Getaway. 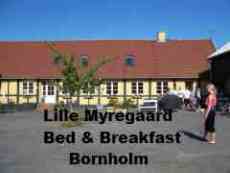 Lille Myregaard B & B.